Der Gesetzgebungsprozess erfolgt nach dem Lamfalussy Verfahren . Die Richtlinie über Insider-Geschäfte und Marktmanipulation (Marktmissbrauch) ist die Rahmenrechtsvorschrift (Stufe I), die durch drei Durchführungsrichtlinien sowie eine Durchführungsverordnung ergänzt wird (Stufe II). Durchführungsrichtlinie 2004/72/EG legt fest welche Kriterien bei der Bewertung von Marktpraktiken nach Artikel 6 Absatz 10 der Rahmenrichtlinie anzulegen sind. Durchführungsrichtlinie 2003/125/EG legt Standards für die sachgerechte Darbietung von Anlageempfehlungen und für die Offenlegung von Interessenkonflikten fest. Durchführungsrichtlinie 2003/124/EG dient der Begriffsbestimmung und setzt die Fristen für die Veröffentlichung von Insider-Informationen fest. Durchführungsverordnung Verordnung (EG) Nr. 2273/2003 stellt Ausnahmeregelungen für Rückkaufprogramme und Kursstabilisierungsmaßnahmen fest. Die (Rahmen-)Richtlinie 2003/6/EG sieht den Marktmissbrauch zum einen in Insider-Geschäften, zum anderen in der Marktmanipulation. Sie beansprucht Geltung für alle Geschäfte mit zugelassenen Finanzinstrumenten, unabhängig davon, ob diese auf einem geregelten Markt erfolgen. Die Richtlinie verpflichtet jeden Mitgliedstaat zur Benennung einer einzigen Regulierungs- und Aufsichtsbehörde. Diese muss gewisse Mindestaufgaben bei der Bekämpfung von Insider-Geschäften und Marktmanipulation erhalten. 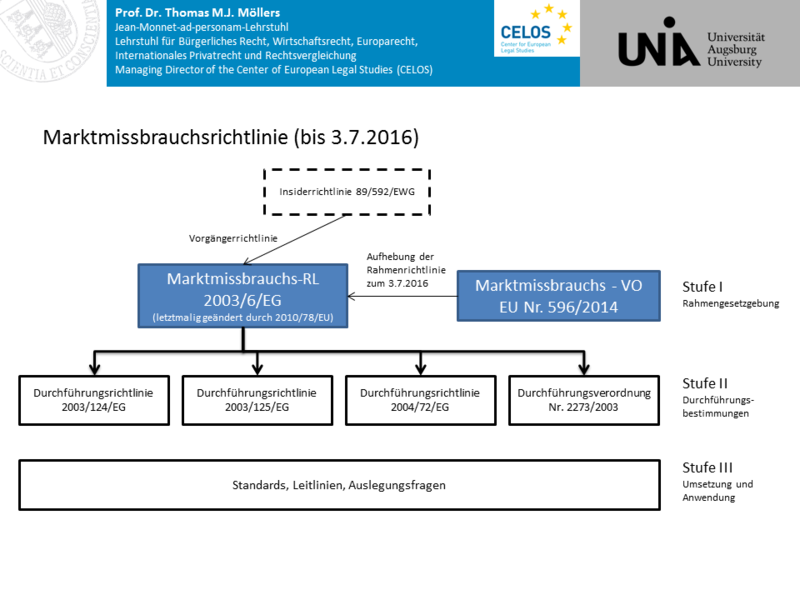 Die Marktmissbrauchsverordnung ( MAR) und die Marktmissbrauchsrichtlinie (MAD) bilden zum 3.7.2016 den neuen europäischen Rechtsrahmen für Marktmissbrauch. Diese Richtlinie sowie die Durchführungsvorschriften werden aufgehoben. 11.12.2002 Kommissionsvorschlag KOM (2002) 724 endg. A company (the issuer), whose shares are admitted to trading on a regulated market, can buy and hold its own shares for future use as means of payment when acquiring shares of another company. If the holding of these shares turns out to be unnecessary, the issuer can allocate them according to article 3 of Regulation 2273/2003/EC or sell them. When acquiring its own shares under the present AMP, the issuer must comply with articles 4, 5 and 6 of Regulation 2273/2003/EC. Transactions performed under this practice must not lead the issuer to hold at any time more than 10% of its shareholder equity. A decision of the shareholders meeting is required in order the issuer to reallocate the shares to another objective than the one publicly disclosed according to the first paragraph. This decision must be publicly disclosed without undue delay. The liquidity contract is the accepted market practice. A public company (the issuer) whose shares are admitted to trading on a regulated market in Portugal may enter into a liquidity contract with a financial intermediary (credit institution or investment company). The issuer places a certain amount of own shares or a certain sum at the disposal of the financial intermediary (FI) so that the latter is able to carry out purchase and sale operations on the spot market on the issuers behalf, on shares issued by itself. A company (the issuer)  which shares are admitted to trading on a regulated market  can buy and hold its own shares for future use as means of payment when acquiring a company. The issuer can hold the shares without any time limit. If the holding of these shares turns out to be unnecessary, the issuer can allocate them to the objectives mentioned in article 3 of Regulation (EC) n°2273/2003, to another accepted market practice or sell them. Members of the Vienna Stock Exchange are allowed to carry out a Valuation transaction by acting for both the buyer and the seller in government bonds and in bonds where they are the issuer or are closely related to the issuer, in order to provide the market with a reference price. A company (the issuer) - whose shares are admitted to trading on a regulated market in Spain  can sign a contract (Liquidity contract) with an Investment firm or a credit institution (Financial Intermediary). Within the Liquidity contract it shall be defined the conditions under which the Financial Intermediary will act on behalf of the issuer, buying or selling shares of the latter, with the only aim of enhancing the liquidity of the transactions and the regularity of the quotation of the shares of the issuer within the limits established in the authorisation from the Shareholders General Meeting to transact business on the own shares of the issuer.